Like many Star Trek shippers, I believed Jadzia and Julian were meant to be, and Worf/Jadzia was one of the dumbest ideas ever. Now she's dead and he's dating Dax's next host(another thing I'm not pleased with, BTW). I guess it's off to denial with me. Co-written with Agent C. DS9/Hellraiser crossover, post-WYLB. 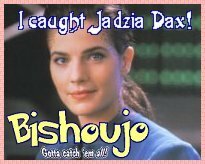 When Jadzia and Jake burst in on Julian and Ezri, things get out of hand. Jadzia, Julian, and a hot summer night. A fractured fairy-tale. Need I say more? A retelling of Henrik Ibsen's A Doll's House for the 24th century.